Bronze with polychrome patina. Gold. Background: Several years ago, the Swedish Ljungqvist Foundation selected me out of eight internationally renowned sculptors to create a monument for Clean Sports. Professor Arne Ljungqvist, an Olympic high jumper and a physician, has dedicated his life to the pursuit of health and to the fight against doping in sports, and the monument was designed to honor his legacy and increase the visibility of the cause. The monument was named “Et Purus” (Latin for “And Pure”) to indicate that “Number One” is legitimate only when it is clean of any drugs. I was grateful for the opportunity to create a visual icon for the message. Aspiring to break records in all disciplines is part of our DNA. But we must protect our health and moral existence in order to survive the climb to the top. Choosing a false and quick path is unsustainable; neither in sports, where it has become an epidemic, nor in any other endeavor. It offends every one, and it endangers the very nature of our society. 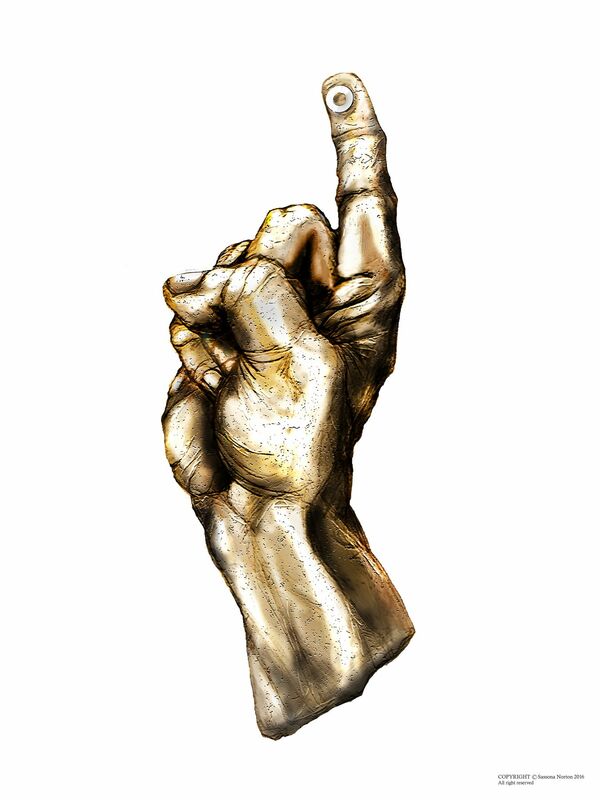 Concept and Description: The universal gesture of Number One, known across continents and time, inspired me to interpret it in a seven foot bronze hand thrusting dynamically into the sky. To signify the winner’s purity, I inserted a polished gold circle at the end of the raised index finger, where blood is drawn. The gold circle proves that the winner’s blood is pure, and that he or she passed the “gold standard”. Genuinely and deservingly, they are at the top of their game. The Monument is planned as an edition. 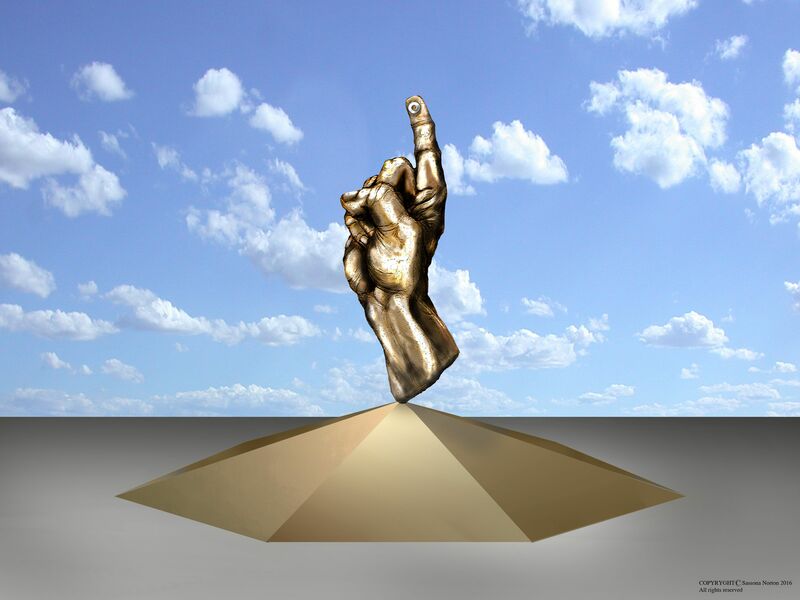 The same sculpture of hand will rise on top of different bases throughout the world. The sameness of the hand will create a wave of strength moving from place to place; while different artistic bases, each especially designed for its unique location, will make every monument “site-specific”. As such, each monument will reach the goal of maximum effectiveness. The first Et Purus is planned for the grounds of the Royal Palace in Monaco, and the second, for the Stadium in Solna, Stockholm. The completion of the two monuments is scheduled for 2021. Et Putus #1: The Royal Palace, Monaco: I felt that the monument in Monaco should respond to the unique national importance of the site. It also had to express the global importance of HSH Prince Albert II, as a leader of vision, a patron of the arts and a champion of clean sports throughout the world. For such a magnitude, I had the winning hand with its symbol of purity, lifting off the top of the world. The globe, cast in bronze and patinated in rich browns and blues, was designed as an essential part of the message. Shown partially, as if it is rising out of the underground, the globe adds its own dynamic to the hand. The seemingly precarious position of the hand on the globe brings to mind the balancing act of so many sports. It also echoes the message that only through integrity, discipline and sustainable control can one reach the top. A bronze band around the globe delivers the contextual statement. 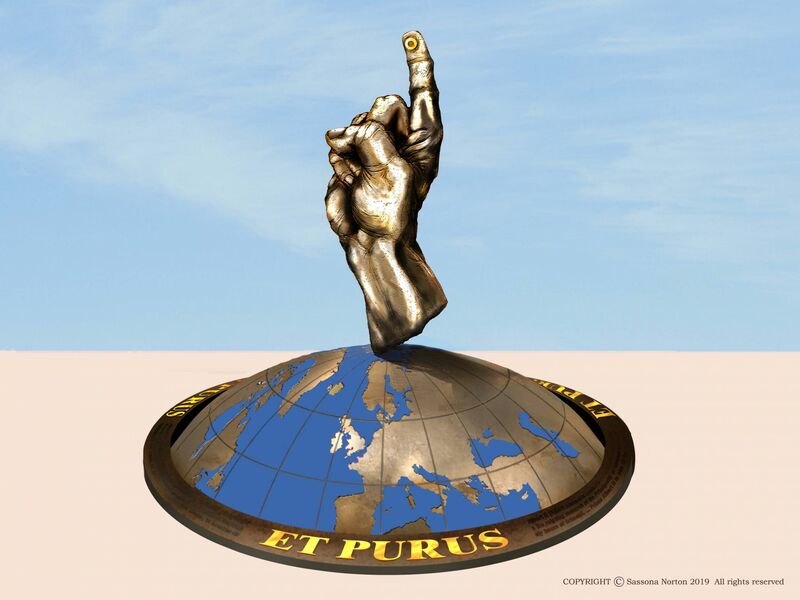 The gold letters of Et Purus shift the eyes to the golden ring at the index finger, and the three separate descriptions of how the monument became a reality motivate the viewer to walk around the monument and absorb all its aspects. Et Putus #2: Solna Stadium, Stockholm, Sweden: As the stadium follows the classic form of the Roman arena in a contemporary application, so does the fabricated pyramid base, which raises the hand sculpture on its tip. Like the stadium, the pyramid is both classical and contemporary. While it resonates with ancient traditions, its simplicity and proportion are contemporary. Its power is derived form the synergy that is created by two movements: The semi-circular shape moves the eye horizontally, and the division to triangular panels pulls the eye upward, to the rising hand with its message of strength and purity. The dialogue between the architecture of the pyramid and the organic form of the hand is served by applying different patinas and textures. The name Et Purus appears on each of the pyramid panels. The accompanying text tells of the monument specific purpose and the generosity of those who made it possible.